Who produced these publications? What demand were they satisfying? Who were the readers? What aims did the editors and publishers have? How did these publications fit into the larger periodical literature of their time? Surprisingly little has been written about these Irish-American publications. 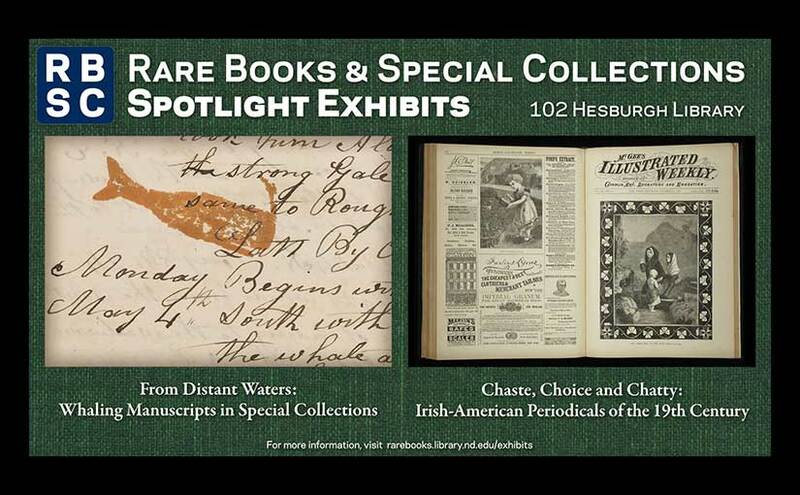 A deep exploration of Hesburgh Library’s Irish-American periodical collection would be rewarding for many reasons, including an increased understanding of networks of Irish in America, of the emerging culture of Irish-Americans, and of the ways in which Irish-Americans connected with Ireland. Our ‘Spotlight’ exhibit currently displays five publications selected from over a dozen titles held by the Library to demonstrate the range and types of these periodicals. Within months, the magazine was listed under a different printer’s name, and by July, it credited Thomas O’Neill as publisher. The transfer was unpleasant, to say the least, and the editorial for May 8, 1858 includes allegations of mismanagement and foul play by the former owners. According to this editorial, the way the paper managed initially was unsustainable. 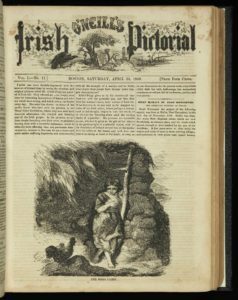 The following year it was renamed O’Neill’s Irish Pictorial, and it is this volume of issues from 1859 that Special Collections holds. It was subsequently named The Irish Pictorial and Irish Illustrated Weekly. In all, the magazine lasted from 1858 to 1861. The illustration of Irish poverty displayed in this issue is a recurring theme in American publications, sometimes accompanied by an exhortation to provide aid to Ireland. An example found in an issue of McGee’s Illustrated Weekly calls on Irish-Americans to forego the celebrations of St. Patrick’s Day as long as Irish people are starving. 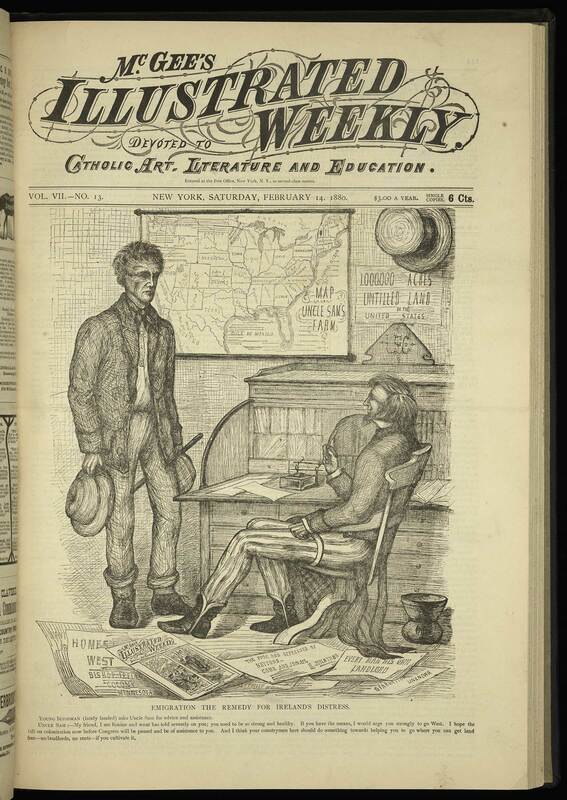 A common theme in these magazines is also that of encouraging Irish immigrants to travel west rather than remain in the cities, and in fact McGee’s Illustrated Weekly maintains a sustained argument for traveling to the midwestern states. The issue in our display includes a picture of a flier advertising Bishop Ireland’s Irish-American Colonisation Company’s scheme to assist Irish to settle in Minnesota. McGee’s Illustrated Weekly was a Catholic weekly that included stories and news of Ireland, and appears to have been directed largely towards an Irish readership. For some time it was edited by Maurice Francis Egan, later a professor of literature here at the University of Notre Dame. McGee’s Weekly is the Catholic illustrated paper in bodily presence and mechanical form, like Harper’s Weekly, but in essence and spirit as opposite as it is possible to imagine. It is chaste, choice and chatty; interesting, independent, ingenious; pithy, pointed and pungent. Its illustrations are beautifully engraved and surprisingly various. It whacks small abuses in social and religious customs with the neatness of a black-thorn wielder, and the taste and delicacy of a French dancing master. No Catholic family that can afford it should be without the lively, literary, lightsome publication of McGee. Miss Cusack, the Nun of Kenmare, is at present engaged on a history of Irish literature . . . the proceeds to be devoted to the foundation and endowment of a home and school combined, where girls could spend some time, from a few weeks to a year, and learn plain sewing, cutting out, plain washing and cooking, housework, etc., and in some cases even fancy work and a few of the higher branches of education, sufficient to fit them for governesses. Having a good collection of books by Mary Francis Cusack, the Nun of Kenmare, in Special Collections, including Advice to Irish Girls in America (New York, 1872) and The Present Case of Ireland Plainly Stated: A Plea for my People and my Race (New York, 1881), this little news item adds to our understanding of the context for her writing. 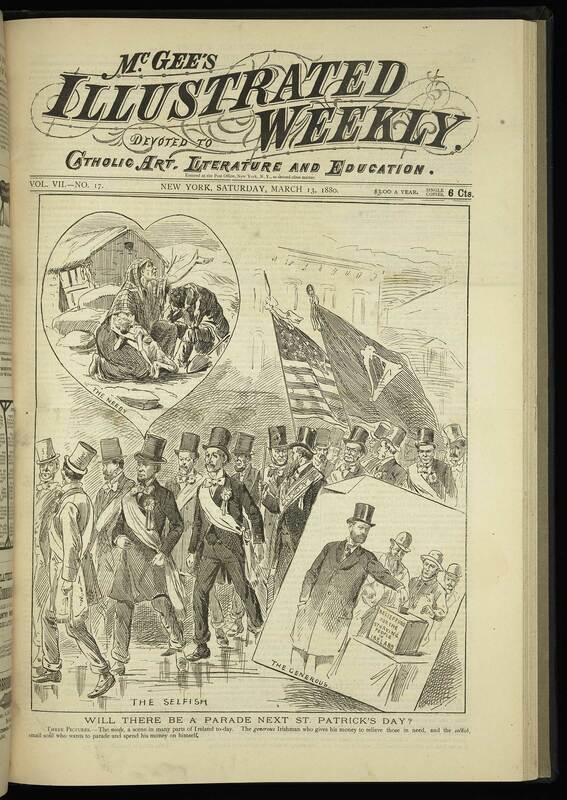 Among the other periodicals displayed is An Gaodhal (The Gael) a magazine founded in New York in 1881 by Michael Logan (Mícheál Ó Lócháin), an Irish-speaker who emigrated in 1871. Logan was principal of a Brooklyn school and led an effort to promote the Irish language, teaching language classes in New York. The issue on display is edited by Geraldine Haverty, who became editor after Logan’s death. Special Collections’ holdings of An Gaodhal was part of the gift received from Francis O’Neill, the Chicago police chief remembered for his collections of Irish dance music. His volumes of An Gaodhal are bound with extra pages inserted for a hand-written contents list. A number of our periodicals were acquired from Rolf and Magda Loeber in a large collection of Irish periodicals of the nineteenth century. Special Collections holds at least a dozen titles, with runs varying from two issues to many years. 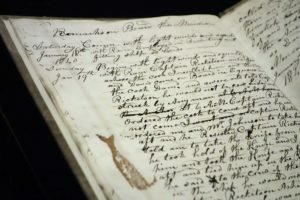 On display are three whaling manuscripts dating from the golden age of the American whaling industry in the first half of the nineteenth century. These include two ship’s logbooks, from the whaling vessels Meridian and Corvo, and a letter written aboard the whaler Columbus.